I’m lamenting the end of winter. 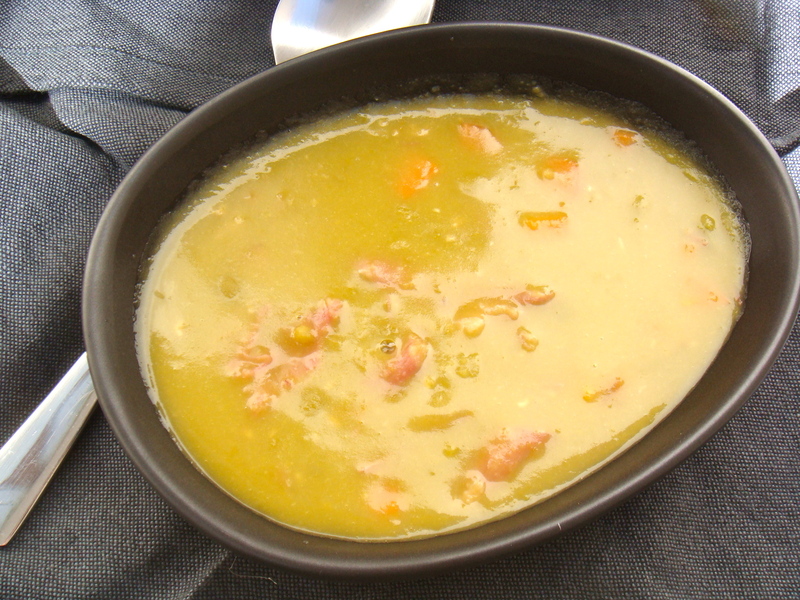 The end of warm comfort food and soup. As soon as the leaves start to fall in Autumn and the days shorten to cool evenings, I’ve got the big soup pot out. It’s the ease of a mid week meal, a warm bowl in hand while watching an old movie on the box. The portability of a decent work lunch is a welcome relief from the work canteen. We didn’t eat pork when I was growing up. My mother is not keen on it. Fortunately I rebelled. I have seen her side glances when my brother and I talk about some nice juicy pork belly and that I just can’t resist it. 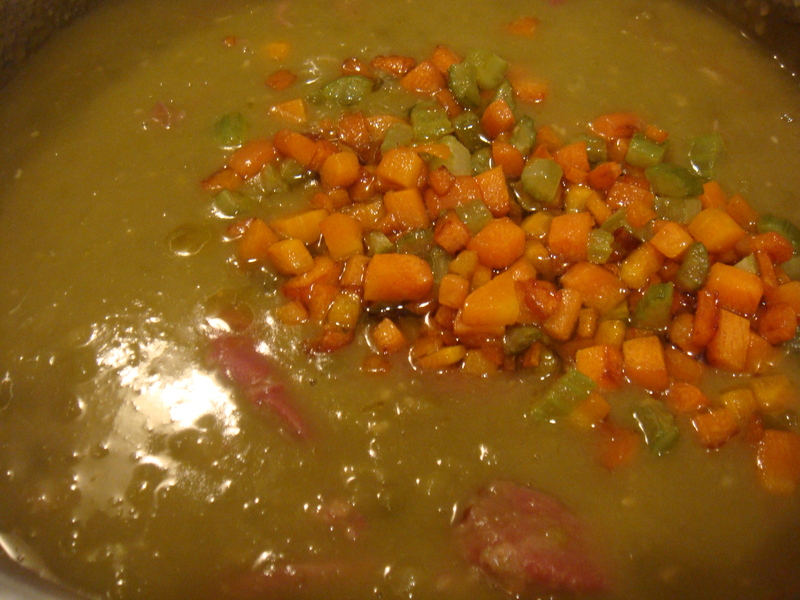 As a consequence I didn’t grow up on ham and pea soup and this is, infact, the first time I’ve made it. I don’t know why I thought it was complicated, the process of finding a hock etc etc. It was, actually, ridiculously simple. This was inspired by recipes from Tom Norrington-Davies and Stephanie Alexander. 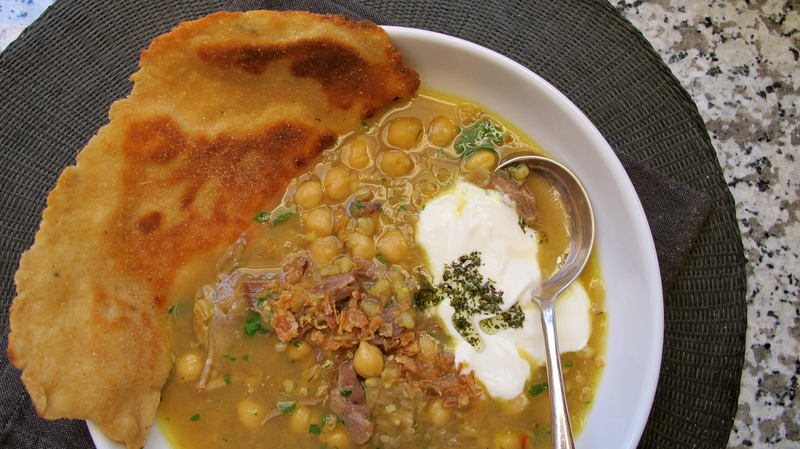 There are many different ways to make this soup but I found this method to be just as simple and was satisfying to tend to on a Sunday afternoon. 1 brown onion, unpeeled, cut in half. Put the hock in a large saucepan with the water, 2 whole carrots, brown onion, 1 celery stick, 3 cloves and the garlic clove (lightly crushed with the side of a knife). Bring to a simmer for about 3 hours or until the ham is cooked and falling away from the bone. Skim the surface over the cooking time to remove any scum that collects on top. 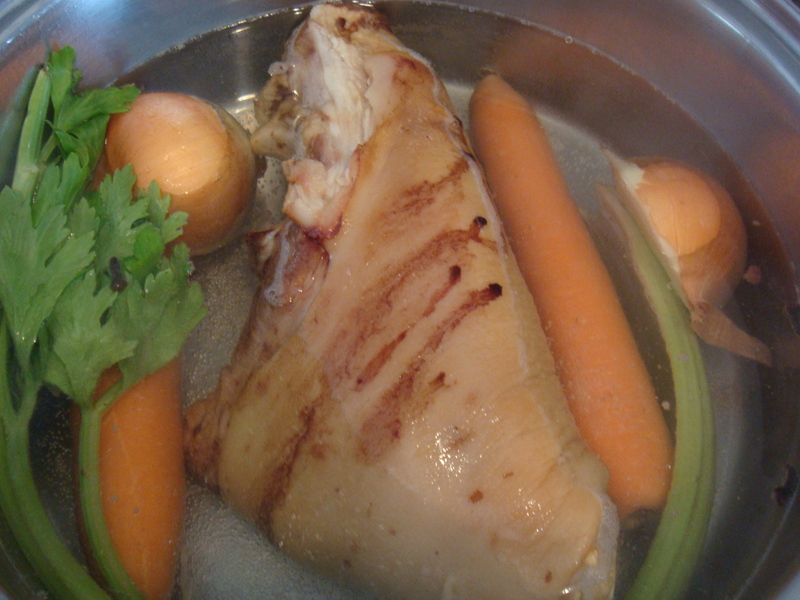 Remove the hock and set aside to cool a bit. Meanwhile remove the vegetables and discard. Strain the liquid and return to a clean saucepan. Bring the liquid to the boil, add the green peas and keep on a rolling simmer for about an hour or until the peas start to fall apart and it looks like mushy peas. Strip off the skin and discard. 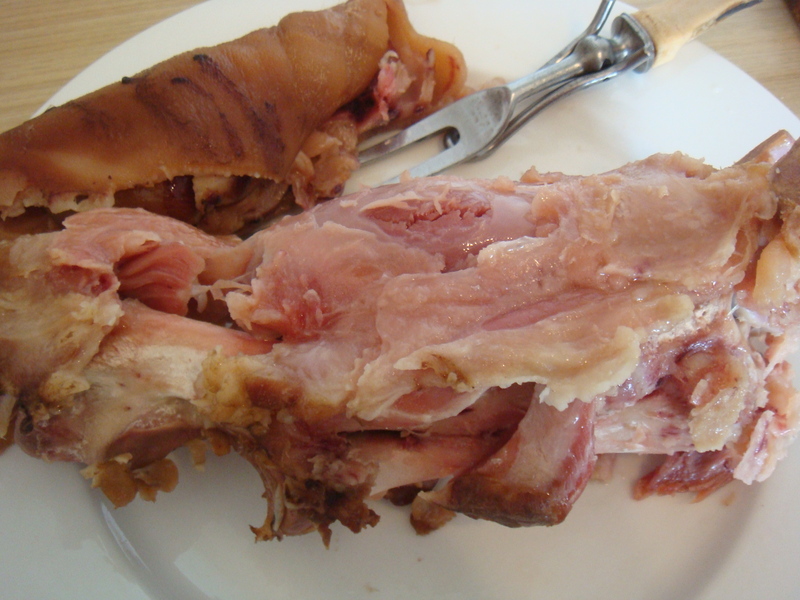 Remove the ham from the bone and add it back to the soup. No need to add salt as the ham provides that but feel free to add black pepper. I was surprised how good it tasted at this stage and the following step is purely optional, but I had already prepared the vegetables. 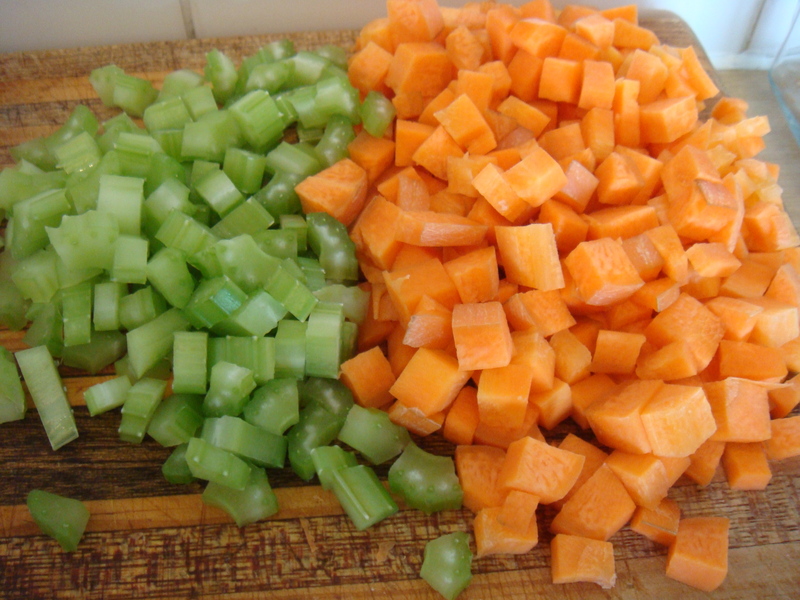 Finely dice 1 stick of celery and 1 carrot, saute in a medium hot pan with some olive oil. Once just softening, add to soup. 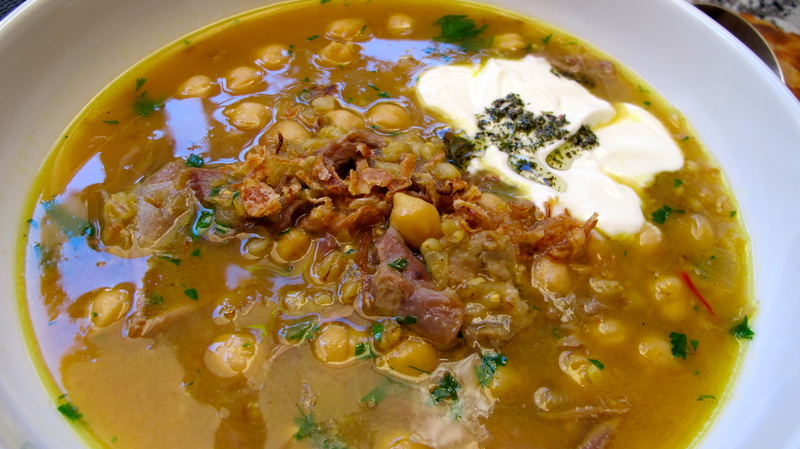 I’m definitely adding this to my winter soup list! 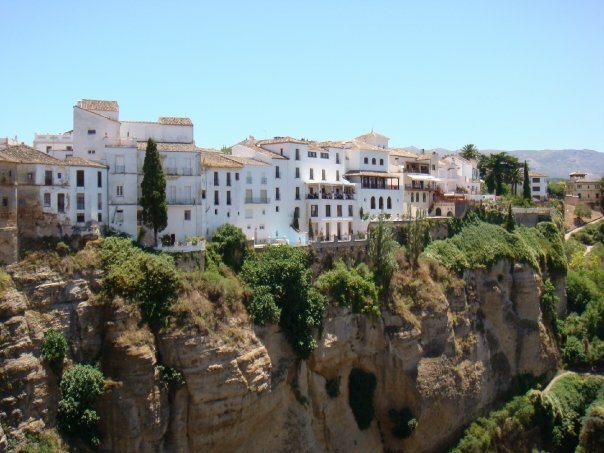 Ronda is a stunning village. 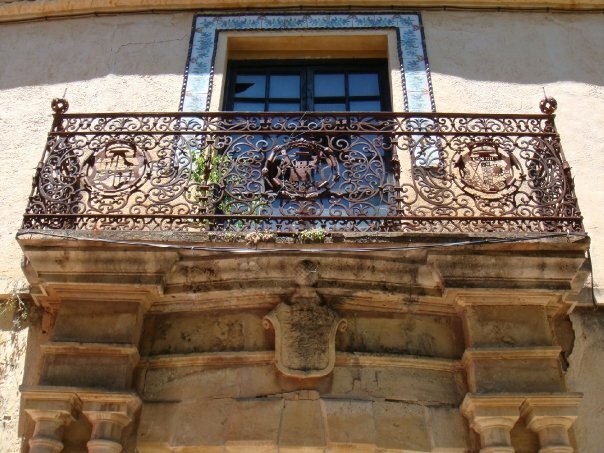 Perched high in the Andalucian mountains, Southern Spain, it has a proud bullfighting history. The story is that it is here, legendary bullfighter, Pedro Romero, founded the style of bullfighting where the matadore stands on the ground to face the bull, and not on horseback, as it had been. I travelled there from Gibraltar on the train line that was built by British garrison officers stationed there in the 1890s who wanted to escape the busy port of Gibraltar. The train wasn’t fast by any means, and from memory it took over 2 hrs to get to Ronda, but the scenery it passes is so stunning it’s worth it. A deep gorge divides the old city from the new. You could stand on the Puente Nuevo bridge, which joins the two, for hours taking in the breathtaking view and trying to imaging life in times gone by. 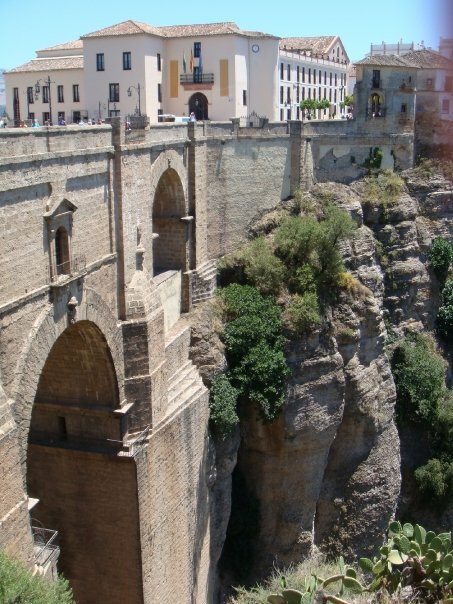 Due to the cliffs and gorges the city was one of the last Moorish cities to fall during the Reconquest of Spain by the Catholics. During one of Jamie Oliver’s trips around Europe he visited Ronda too. 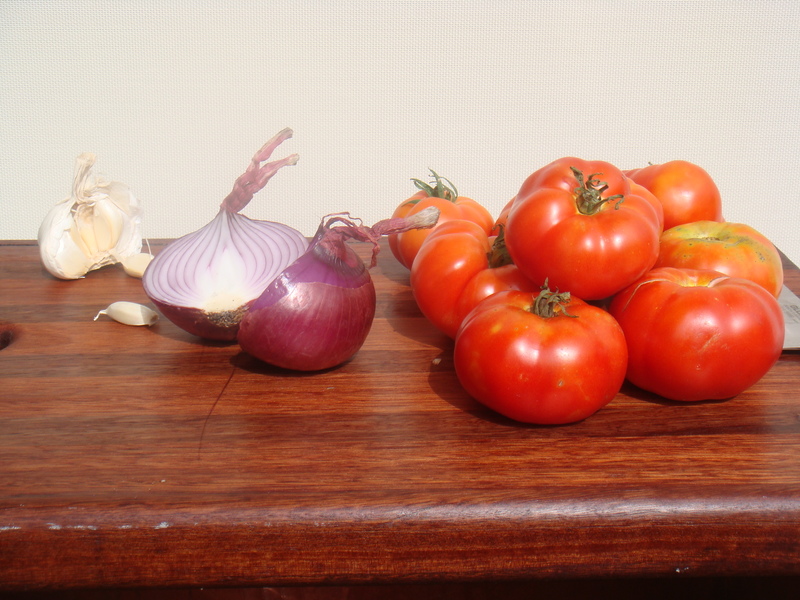 He chose to make their gazpacho, pimping it up by grilling the onion for more flavour and adding almonds and orange. I’m sure it tasted great but I’m not sure the Andalucians would approve. 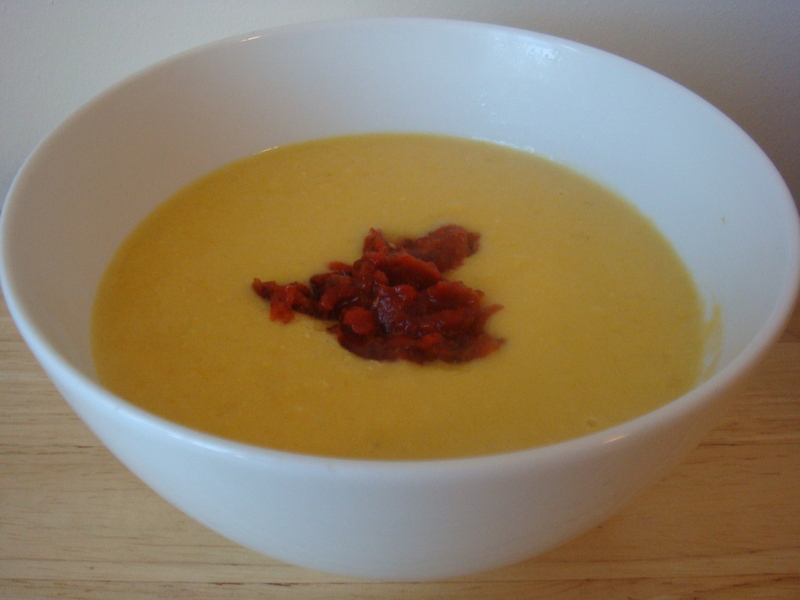 There are many different recipes for Gazpacho and it’s another one of those dishes everyone thinks their version is the correct one. Mine is a simple gazpacho, made from simple ingredients. 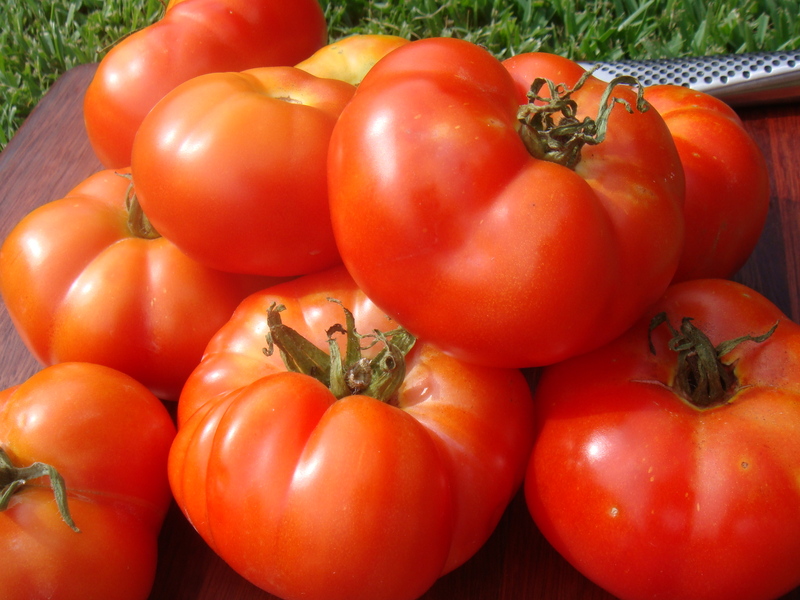 Always only made and eaten in the heat of summer when tomatoes are in season and full of flavour. 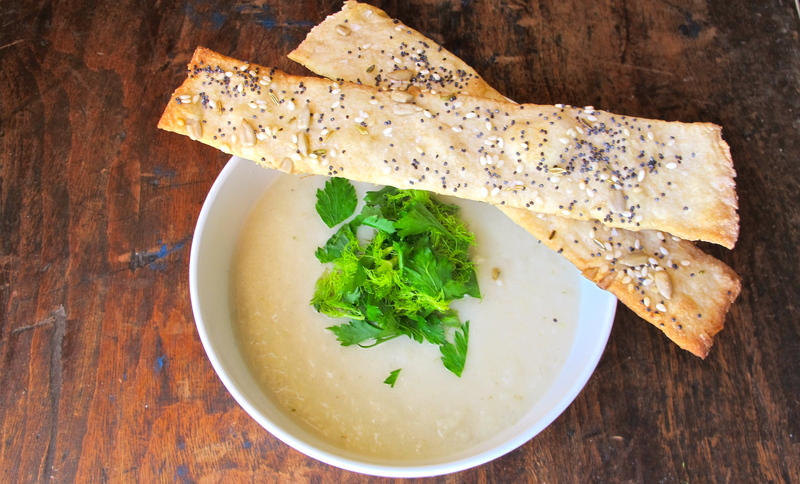 This soup is served cool as a refreshing start to any meal. Soak bread in water (about 250-300mls) enough to just cover the bread. Leave to soak for 5-10 minutes until bread has soaked up water. Then add cucumber and tomatoes and process until smooth. Add soaked bread including residual water, olive oil, red wine vinegar, salt and pepper. Blend until smooth. 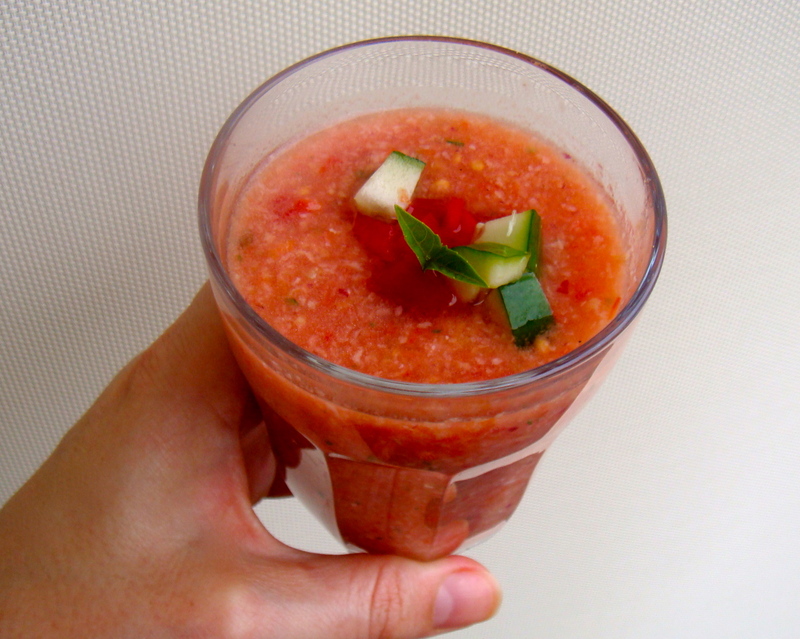 This is a rustic gazpacho and if you prefer it smoother you can rub it through a fine sieve. 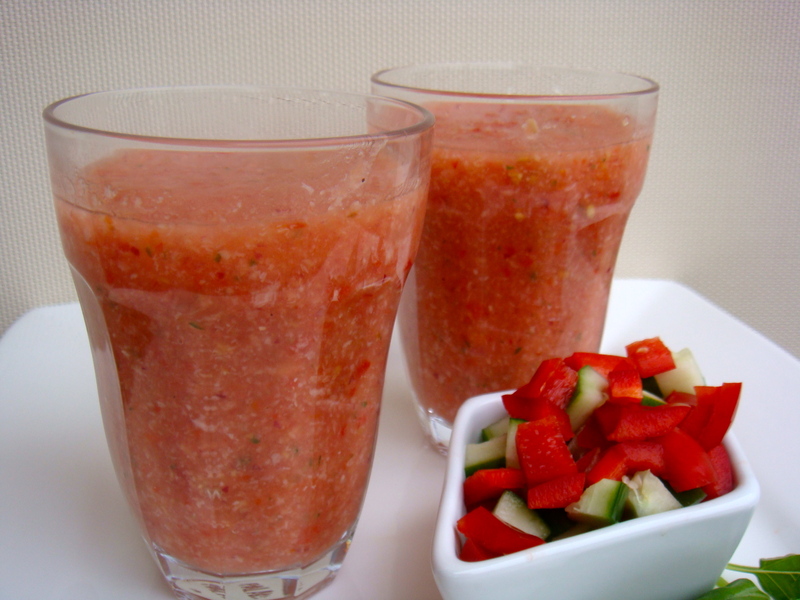 Serve cool in a glass with finely chopped red capsicum and cucumber on the side. Depending on your tomatoes this makes 1.5-2L of gazpacho. Easily enough for 10-12 people as an amuse bouche or starter.